"C" behind the model No. stands for consumer type high cap type. Q-Lite recommends for standard charging: 0oC ~ 45oC, for rapid charging: 10oC ~ 40oC and for discharging: -20oC ~ +50oC. Strict control recommended over rapid charge. Q-Lite recommends strict control over rapid charge. Other high temperature models are also available upon request, like 4/3D, etc. Above battery capacities obtained at 0.1C charge & 0.2C discharge at 25oC. "W" behind the model No. stands for wide temperature range applications. Ambient temperature for standard charging: -30oC~+55oC, for discharging: -30oC ~ +70oC. At -30oC ~ +55oC batteries are capable of permanent charging at 0.03-0.1C, and 1-10C discharge. Superior trickle charge acceptance performance and high reliability. Excellent charge and discharge performance within a wide temperature range. Other wide temperature range models are also available upon request, as 4/3D. 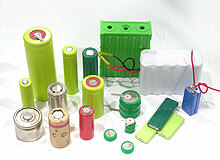 Designations: "K" type standard for low temperature version battery, e.g. AA120K.